The goal of our research is to discover, understand, and apply new mechanisms for controlling spins in magnetic devices. 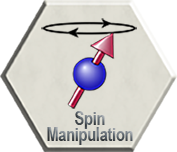 This field is important both because it is an area of rapid progress in fundamental materials physics (e.g., Berry phases, topological materials, and other effects of spin-orbit coupling) and because improved spin control can often be applied quickly for technology. We aim to provide the scientific foundations for energy-efficient nonvolatile memories with revolutionary capabilities and also frequency-agile nanoscale microwave oscillators extendable to THz frequencies.